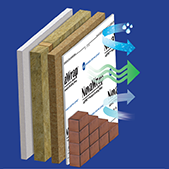 NovaWrap™ Aspire™ house wrap provides advanced protection against air and moisture infiltration. Its industry leading permeance rating is optimized for better “building science.” It is breathable, allowing vapor and condensation to escape from wall cavities. It’s also UV and weather resistant and can be left exposed up to six months. Premium gauge thickness for added impact resistance. Exclusive Colorfast™ formulation locks-in the color for superior retention. Exclusive Duratron™ vinyl technology for long lasting durability. An extension of Metrie’s Then & Now Finishing Collections™, wainscot moulding provides professionals and homeowners with elements required to create stylistic wall paneling designs for any room. These coordinated paint-grade profiles and boards have been designed to reduce the effort associated with planning, selecting, and fitting appropriate products together to construct a wall paneling section. The snow has already started to fall out West – Mother Nature’s cheeky reminder that winter is right around the corner. Here’s a handy checklist to help you and your customers get your home winter ready – inside and out. Clean the gutters – The leaves are falling. Those that sit in the gutter will trap and pool water, which have the potential to cause big damage with a big snow or rainfall. Rake or mulch leaves – Most municipalities offer a pick-up program for garden debris. While raking gives your lawn a cleaner look, mulching as you do the final mow will leave a layer of natural compost on your lawn all winter. Inspect the roof – Check for loose shingles or areas where there may be water leaks. It’s warmer to do it now than when the temperatures hit subzero. Shut off outdoor water supply – Exterior hoses and irrigation systems should be drained; outdoor water supply can be blocked or shut off from inside to prevent pipe freezing. Sweep the chimneys – This is a job to have done by a professional. According to Fire Prevention Canada, most chimney fires are caused by wood-burning units. Caulk around windows and doors – Nothing worse than cold air seeping in through tiny cracks. Weather changes can cause shifting, even in new houses, so it’s worth a quick go-around the house. Inspect the furnace or heating unit – No one wants to have to replace the heat supply unit when it’s -20 degrees. Insulate the attic – While you’re up there, be sure you don’t have any rodents looking for a winter home. Contact us for all your supply needs. Our staff are here and ready to help. Contact us for all your supply needs. Our staff are here and ready to help. Mitten’s popular enVISION it software is now available on iPad! Let Mitten Pro take the guesswork out of designing your home’s exterior. Upload a photo or use a sample home and see a number of products from manufacturers such as Mitten, GenStone, Longboard, and Procanna on the image of the home. Download at the Apple App Store. Search “Mitten Pro”. For iPad only. With the warm weather still lingering, it’s hard to imagine the shift to winter that will take place in a few weeks. September is a great time to think about waterproofing your home. RESISTO offers a number of coatings, sealers and membranes to help you get started. RESISTOSEAL FOUNDATION COATING is composed of bitumen and fast-evaporating solvent. It is used for the damproofing for foundation walls, footings, retaining walls, wing walls, abutments and culverts. The BASIC WATERPROOFING MEMBRANE is a self-adhesive membrane made of elastomeric bitumen and a trilaminate woven polyethylene facer. It is the ideal waterproofing solution for roofs as a base sheet in two-ply roofing systems. It can also be used for decks, balconies, patios, foundations and foundation cracks, shower bases and wash-up rooms. As projects shift from summer to autumn, it’s a great time to look at your inventory. IRWIN TOOLS has released a new line of ergonomic cutting tools to help you get the job done. The new IRWIN VICE-GRIP cutting pliers are made in Germany and backed by IRWIN’s lifetime guarantee. Nails – $20 per box! Brand new 50 lb boxes of nails. $20 per box plus GST. 2401 19th St, Didsbury, AB.